The Baltic Germans (German: Deutsch-Balten or Deutschbalten, later Baltendeutsche) are ethnic German inhabitants of the eastern shores of the Baltic Sea, in what today are Estonia and Latvia. Since their expulsion from Estonia and Latvia and resettlement during the upheavals and aftermath of the Second World War, Baltic Germans have markedly declined as a geographically determined ethnic group. The largest groups of present-day descendants of the Baltic Germans are found in Germany and Canada. It is estimated that several thousand still reside in Latvia and Estonia. For centuries Baltic Germans and the Baltic nobility constituted a ruling class over native non-German serfs. The emerging Baltic-German middle class was mostly urban and professional. In the 12th and 13th centuries Catholic Germans, both traders and crusaders (see Ostsiedlung), began settling in the eastern Baltic territories. After the Livonian Crusade, they assumed control of government, politics, economics, education and culture of these lands, ruling for more than 700 years until 1918 — usually in alliance with Polish, Swedish or Russian overlords. With the decline of Latin, German became the language of all official documents, commerce, education and government. At first the majority of German settlers lived in small cities and military castles. Their elite formed the Baltic nobility, acquiring large rural estates and comprising the social, commercial, political and cultural elite of Latvia and Estonia for several centuries. After 1710 many of these men increasingly took high positions in the military, political and civilian life of the Russian Empire, particularly in Saint Petersburg. Baltic Germans held citizenship in the Russian Empire until the Revolution of 1918. They then held Estonian or Latvian citizenship until the occupation and later annexation of these areas by the Soviet Union in 1939–1940. The Baltic German population never surpassed more than 10% of the total population. In 1881 there were 180,000 Baltic Germans in Russia's Baltic provinces, but by 1914 this number had declined to 162,000. In 1881 there were approximately 46,700 Germans in Estonia (5.3% of the population). According to the Russian Empire Census of 1897, there were 120,191 Germans in Latvia, or 6.2% of the population. Baltic German history and presence in the Baltics came to an end in late 1939, following the signing of the Molotov–Ribbentrop Pact and the subsequent Nazi–Soviet population transfers. Almost all the Baltic Germans were resettled by Nazi Germany under the Heim ins Reich program into the newly formed Reichsgaue of Wartheland and Danzig-West Prussia (on the territory of the occupied Second Polish Republic). In 1945, most ethnic Germans were expelled from these lands by the Soviet army. Resettlement was planned for the territory remaining to Germany under terms of the border changes promulgated at the Potsdam Conference, i.e. west of the Oder–Neisse line, or elsewhere in the world. Ethnic Germans from East Prussia and Lithuania are sometimes incorrectly considered Baltic Germans for reasons of cultural, linguistic, and historical affinities. But the Germans of East Prussia held Prussian, and after 1871, German citizenship, because the territory they lived in was part of the Kingdom of Prussia. Baltic Germans were not a purely German ethnic group. The early crusaders, tradesmen and craftsmen often married local women, as there were no German women available. Some noble families, such as the Lievens, claimed descent through such women from native chieftains. Many of the German Livonian Order soldiers died during the Livonian War. New German arrivals came to the area. During this time the Low German (Plattdeutsch) of the original settlers was gradually replaced by the High German (Hochdeutsch) of the new settlers. In the course of their 700-year history, Baltic German families had ethnic German roots, but also had extensive intermarriage with Estonians, Livonians and Latvians, as well as with other Northern or Central European people, such as Danes, Swedes, Irish, English, Scots, Poles, Hungarians and Dutch. In cases where intermarriage occurred, members of the other ethnic groups frequently assimilated into German culture, adopting language, customs, and German family names. They were then considered Germans, leading to the ethnogenesis of the Baltic Germans. Barclay de Tolly and George Armitstead, who emigrated from the British Isles, married into and became part of the Baltic-German community. Estland (Latin: Estonia; Estonian: Eestimaa), roughly the northern half of present-day Estonia; major towns: Reval (Tallinn), Narva (Narva), Wesenberg (Rakvere), Weissenstein (Paide), Hapsal (Haapsalu). Livland (Latin: Livonia; Estonian: Liivimaa; Latvian: Vidzeme), roughly the southern half of present-day Estonia and the northern and eastern part of today's Latvia (Vidzeme); major towns: Riga, Wenden (Cēsis), Wolmar (Valmiera), Walk (Valga and Valka), Dorpat (Tartu), Pernau (Pärnu), Fellin (Viljandi). Kurland (Latin: Curonia; also English: Courland; Latvian: Kurzeme), roughly the western half of present-day Latvia (Kurzeme and Zemgale); major towns: Mitau (Jelgava), Windau (Ventspils), Libau (Liepāja). Ösel (the island of Saaremaa) belonging to present-day Estonia; major town: Arensburg (Kuressaare). Map of Terra Mariana in 1260. Small numbers of Ethnic Germans began to settle in the area in the late 12th century when traders and Christian missionaries began to visit the coastal lands inhabited by tribes who spoke Finnic and Baltic languages. Systematic conquest and settlement of these lands was completed during the Northern Crusades of the 12th and 13th centuries which resulted in creation of the Terra Mariana confederation, under the protection of Roman Popes and Holy Roman Empire. After the heavy defeat in the 1236 Battle of Saule the Livonian Brothers of the Sword became a part of the Teutonic Order. During the next three centuries German-speaking soldiers, clergymen, merchants and craftsmen constituted the majority of the quickly growing urban population, as the native inhabitants usually were prohibited from settling there. Membership in the Hanseatic League and active trade links with Russia and Europe increased wealth of Baltic German traders. As the military power of the Teutonic Knights weakened during the 15th century wars with the Kingdom of Poland, Grand Duchy of Lithuania and Grand Duchy of Moscow, the Livonian branch in the north began to pursue its own policies. When the Prussian branch of the Order secularized in 1525 and became a Polish vassal state as the Duchy of Prussia, the Livonian branch remained independent while searching for a similar way to secularize. Livonia became mostly Protestant during the Reformation. In 1558, the Tsardom of Russia began the Livonian War against Terra Mariana which soon involved the Kingdoms of Poland, Sweden, and Denmark and lasted for 20 years. 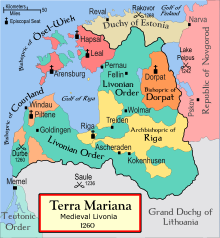 In 1561, Terra Mariana ceased to exist and was divided among Denmark (which took the island of Ösel), Sweden (which took northern Estonia) and Poland, which annexed the newly created Duchy of Livonia, and granted the Duchy of Courland and Semigallia, a vassal state of Poland-Lithuania, to the last Master of the Livonian Order Gotthard Kettler. The secularized land was divided among the remaining knights who formed the basis of Baltic nobility. The Duchy of Courland and Semigallia existed as a German-speaking country until 1795, while the northern part of Duchy of Livonia was conquered by Sweden which controlled parts of Estonia between 1561 and 1710 and Swedish Livonia between 1621 and 1710, having signed an agreement with the local Baltic German nobles not to undermine their political rights and autonomy. The Academia Gustaviana (now University of Tartu) was founded in 1632 by King Gustavus II Adolphus of Sweden. It remained the only institution of higher education in the former Livonian territories and became the intellectual focus of the Baltic Germans. At the end of the 17th century Sweden introduced the land reduction in its Baltic provinces and properties held by German nobility became the property of the Crown. That effectively turned serfs into free peasants, but it would be overturned when Russia conquered these territories in 1710 and restored the rights of German landowners under the Treaty of Nystad. The many manors in Estonia and Latvia testify to the former splendor of the Baltic German landowning class. Pictured: Vääna manor, Estonia. Between 1710 and 1795, following Russia's success in the Great Northern War and the three Partitions of Poland, the areas inhabited by Baltic Germans eventually became Baltic governorates of Russian Empire - Courland Governorate, Governorate of Livonia and Governorate of Estonia. The Baltic provinces remained autonomous and were self-governed by the local Baltic nobility. Until the imperial reforms of 1880s local government was in the hands of the landtag of each province, in which only members of the matriculated Baltic nobility held membership and cities were ruled by German burgomasters. Between 1710 and approximately 1880 Baltic German ruling class enjoyed great autonomy from the Imperial government and achieved great political influence in the Imperial court. Starting from the 18th century Baltic German nobility increasingly assumed leading posts in the Russian imperial government, after all, Russia was ruled by a German dynasty of Holstein-Gottorp, and Baltic Germans provided a well-educated, Westernized elite. Germans, other than the local estate-owners, mainly lived in the cities, such as Riga, Reval, Dorpat, Pernau and Mitau. As late as the mid-19th century the population of many of these cities still had a German majority, with Estonian, Latvian or Jewish minorities. By 1867 Riga's population was 42.9% German. Until the late 19th century most of the professional and learned classes in the region, the literati, were Germans. German political and cultural autonomy ceased in the 1880s, when Russification replaced German administration and schooling with the usage of Russian. After 1885 provincial governors usually were Russians. Years of peace under Russian rule brought increasing prosperity and many new manor houses were built in country estates, but economic exploitation worsened situation of the native population. For examples, see List of palaces and manor houses in Latvia and List of palaces and manor houses in Estonia. The native Latvian and Estonian population enjoyed fewer rights under the Baltic German nobility compared to the farmers in Germany, Sweden, or Poland. In contrast to the Baltic Germans, Estonians and Latvians had restricted civil rights and resided mostly in rural areas as serfs, tradesmen, or as servants in manors and urban homes. They had no rights to leave their masters and no last names. This was in keeping with the social scheme of things in Russian Empire, and lasted until the 19th century, when emancipation from serfdom brought those inhabitants increased civil freedoms and some political rights. In 1804 Livonian peasant law was introduced by Imperial government, aimed at improving condition of serfs. Serfdom was abolished in all Baltic provinces between 1816 and 1820, about half a century earlier than in Russia proper. For some time there was no outward tension between the German speakers and indigenous residents. If earlier any Latvian or Estonian who managed to rise above his class was expected to Germanize and to forget his roots, by the middle of 19th century German urban classes began to feel increasing competition from the natives, who after the First Latvian National Awakening and Estonian national awakening produced their own middle class and moved to German and Jewish dominated towns and cities in increasing numbers. The Revolution of 1905 led to attacks against the Baltic German landowners, the burning of manors, and the torture and even killing of members of the nobility. During the 1905 Revolution groups of rebels burned over 400 manor houses and German owned buildings and killed 82 Germans. In response Cossack punitive expeditions aided by German nobles and officers burned down hundreds of farms, arrested and deported thousands and summarily executed at least 2,000 people. Reaction to 1905 Revolution included a scheme by Karl Baron von Manteuffel-Szoege and Silvio Broedrich-Kurmahlen to pacify the countryside by settling up to 20,000 ethnic German farmers, mostly from Volhynia, in Courland. World War I brought the end of the alliance of the Baltic Germans and the Russian Tsarist government. German heritage made them to be seen as the enemy by Russians. They were seen also as traitors by the German Empire if they remained loyal to Russia. Their loyalty to the state was questioned and rumors of a German fifth column increased together with the defeats of the Imperial army led by Baltic German general Paul von Rennenkampf. All German schools and societies were closed in the Estonian Governorate and Germans were ordered to leave the Courland Governorate for inner Russia. Courland was conquered by Germany in 1915 and included into the military Ober Ost administration. After the Russian surrender at the Treaty of Brest-Litovsk in 1917, the German Empire occupied the remaining Baltic provinces. The Ober Ost military administration began plans for German colonization of Courland. On April 20, 1917 the Commander-in-Chief of the Eastern front announced that 1/3 or arable land there should be reserved for settlement by German war veterans. This was approved by Courland's German nobility on September 22, 1917. Livonian and Estonian nobles on January 28, 1918 delivered a note of independence to Soviet representatives in Stockholm, announcing their intent to break away from Russia under the rights granted to them by the Treaty of Nystad of 1721. In response Bolsheviks, who controlled Estonia, arrested 567 leading Germans and deported them to Russia. After signing the Treaty of Brest-Litovsk they were allowed to return. Under German-Soviet treaties, Germany gained control over Courland, Riga, Saaremaa (Ösel), Livonia and Estonia. In spring of 1918 Baltic Germans announced the restoration of the independent Duchy of Courland and Semigallia and pursued plans for uniting it with the Kingdom of Prussia. On April 12, 1918 Baltic German representatives from all Baltic provinces met in Riga and called on the German Emperor to annex the Baltic lands. Later, instead of outright annexation, a plan for a United Baltic Duchy ruled by Duke Adolf Friedrich of Mecklenburg was developed. Its regency council met on November 9, 1918 but collapsed together with the German Empire. The Baltic Germans' rule and class privileges came to the end with the demise of the Russian Empire (due to the Bolshevik revolution of October 1917) and the independence of Estonia and Latvia in 1918–1919. Baltic Germans greatly suffered under Bolshevik regimes in Estonia and Latvia. While short-lived, they pursued Red Terror against Germans, often killing them purely because of their nationality. After the collapse of the German Empire, Baltic Germans in Estonia began forming volunteer units to defend against the Bolshevik threat. On November 27, 1918 this was authorized by the Estonian government, and the Volunteer Baltic Battalion (Freiwilligen Baltenbataillon) was formed under the command of Colonel Constantin von Weiss (de). During the Estonian and Latvian independence wars of 1918–1920, many Baltic Germans signed voluntarily into the newly formed Estonian and Latvian armies to help secure the independence of these countries from Russia. These Baltic German military units became known as the Baltische Landeswehr in Latvia and Baltenregiment (de) in Estonia. The State archives of Estonia and Latvia keep individual military records of each person who fought in this war. Baltische Landeswehr units took Riga on May 22, 1919 which was followed by White Terror in which up to 2,000 people, mostly Latvians, were shot as suspected Bolshevik supporters. Baltic German outlying estates were frequent targets of local Bolsheviks (as portrayed in the film, Coup de Grâce) and the combination of local Bolsheviks and nationalists following independence brought about land nationalisations and a displacement of Baltic Germans from positions of authority. Baltic Germans of the Livonian Governorate found themselves in two new countries, both of which introduced sweeping agrarian reforms aimed at the large land owners, an absolute majority of whom were Germans. As a result of the Russian Revolution of 1917 and the subsequent Russian Civil War, many Baltic Germans fled to Germany. After 1919, many Baltic Germans felt obliged to depart the newly independent states for Germany, but many stayed as ordinary citizens. In 1925 there were 70,964 Germans in Latvia (3.6%) and 62,144 in 1935 (3.2% of population). Riga remained by far the largest German center with 38,523 Germans residing there in 1935, while Tallinn then had 6,575 Germans. While the German landed class soon lost most of their lands after the agrarian reforms, they continued to work in their professions and to lead their companies. German cultural autonomy was respected. The Committee of the German Baltic Parties in Latvia and Deutsch-baltische Partei in Estland in Estonia participated in elections and won seats. At the same time, as both young states built their institutions this often reduced the status of their minorities. In Latvia, children of mixed marriages were registered as Latvians while in Estonia they took the nationality of their fathers, who increasingly were Estonians. This quickly reduced the number of German children. German place names were eliminated from public use. German congregations lost their churches. Tallinn Cathedral was given to an Estonian congregation in 1927. After the 1923 referendum St. James's Cathedral in Riga was lost and Riga Cathedral taken away after another referendum in 1931. At the start of independence Baltic Germans owned 58% of land in Estonia and 48% in Latvia. Radical agrarian reforms were implemented in both countries to break German power and to distribute land to the veterans of independence wars and landless peasants. This largely destroyed the landed class of German noble families and their economic base. On October 10, 1919 the Estonian parliament expropriated 1,065 estates (96.6% of all estates). March 1, 1926 law set the compensation to the former owners of arable land at about 3% of its market value and no compensation at all for the forests. This almost instantly bankrupted the German noble class, even if they were allowed to keep some 50 ha of their lands. On September 16, 1920 the Constitutional Assembly of Latvia nationalized 1,300 estates with 3.7 million hectares of land. Former German owners were allowed to keep 50 ha of land and farm equipment. In 1924, the Saeima decided that no compensation would be paid to former owners. In 1929, the Saeima voted that veterans of the Baltische Landeswehr could not receive any land. In Estonia, there was only one German party, which from 1926 was led by Axel de Vries (de), editor of Revaler Bote. Their leading parliamentarian was Werner Hasselblatt (1890–1958). Germans never received ministerial posts in governments. The three largest minorities Germans, Swedes and Russians sometimes formed election coalitions. The Deutsch-baltische Partei in Estland was established to defend the interests of German landowners, who wanted to receive compensation for their nationalized lands and properties. After land nationalization they received no compensation, but could keep plots up to 50 ha which could not support their manor houses. Germans were banned from governmental and military positions. Many Germans sold their properties and emigrated to Scandinavia or Western Europe. Most of the grand manor houses were taken over by schools, hospitals, local administration and museums. Estonia's Baltic German population was smaller than Latvia's, so as Estonians continued to fill professional positions such as law and medicine, there was less of a leadership role for the Baltic Germans. Baron Wilhelm Wrangell, leader of the Baltic German cultural association between 1933 and 1938 was included in the Estonian Council of State after 1937 as a token representative of minorities. The last leader of Baltic German Cultural administration was Hellmuth Weiss. On February 12, 1925 Estonia adapted the Cultural Autonomy and national Minorities act which provided for some cultural autonomy of Germans. Despite this, German community in Estonia continued to decline as the majority of young people chose to emigrate. By 1934 there were 16.346 Baltic Germans in Estonia, 1.5% of the total population. Estonia allowed German schools in German language, they were overseen by the Gesellschaft Deutsche Schulhilfe, which was part of the Union of German Societies in Estonia. After adoption of the Minority law of February 5, 1925 the Baltic German Cultural Council was created on November 1, 1925. In 1928, German schools were attended by 3,456 pupils. In Latvia, Baltic Germans remained a politically active and organized ethnic group, although they lost some influence after the 1934 Latvian coup d'état. A couple of times Germans received ministerial posts in coalition governments. Commander of Latvia's Navy between 1919 and 1931 was Admiral Archibald Count von Keyserling. Six, later seven, German parties existed and formed a coalition in the Saeima. The leading politicians were Baron Wilhelm Friedrich Karl von Fircks, leader of the Baltic-German People's Party and Paul Schiemann, editor in chief of the Rigasche Rundschau newspaper and leader of the Baltic-German Democratic Party. Increased activity of National Socialist supporters in the German community led to the resignation of Schiemann from the Rigasche Rundschau in 1933. Minority cultural affairs were overseen by the Ministry of Culture and the German section was led by pastor Karl Keller (1868–1939) and later by Dr. Wolfgang Wachtsmuth. In 1923, there were 12.168 pupils in German schools. The Herder Institute, a private German university with three faculties (Theology, Jurisprudence and Political Science and Philosophy) was established. In 1926, the German community introduced voluntary self-taxation, asking all Germans to contribute up to 3% of their monthly income to community activities. In 1928, the Baltic German National Community was established as the central representative body of Baltic Germans in Latvia. Educational autonomy of Germans was severely limited in 1931–1933, when the Minister of Education Atis Ķeniņš introduced a policy of latvianization in minority schools. On July 18, 1934 the autonomous German schools were brought under complete control of the Ministry of Education. After the May 15, 1934 coup all associations and independent business organizations had to shut down, this affected the German community especially hard, as they lost their ancient communal centers – guilds, and all of their property was nationalized. Then followed a wave of takeovers of Jewish, Russian and German businesses – banks, factories and trading companies were purchased by state owned banks at set rates in order to reduce minority control over businesses. Nazi plans to "resettle" Baltic Germans in "Warthegau"
Baltic German resettlers disembark at the Port of Stettin from the ship "General Steuben"
Resettled Baltic Germans take new home of expelled Poles in "Warthegau"
As a result of the secret agreements of the Molotov–Ribbentrop Pact between Nazi Germany and the Soviet Union in 1939, Estonia and Latvia were assigned to the "Soviet sphere of influence". One of the main conditions posed by Hitler to Stalin in August 1939 was the prior transfer of all ethnic Germans living in Estonia and Latvia to areas under German military control. These became known as the Nazi–Soviet population transfers. Stalin proceeded to set up Soviet military bases in Estonia and Latvia in late 1939. In a speech to Reichstag on October 6, 1939 with was broadcast live on radio, Hitler announced that German minorities should be resettled in the Reich (Back home to Reich, heim ins Reich). Resettlement was overseen by Himmler who created a new Reich Commisariat for the Strengthening of Germandom for this purpose. Treaties were signed with Estonia and Latvia in 1939 and 1940 concerning the emigration of Baltic Germans and the liquidation of their educational, cultural, and religious institutions. Nazi Germany succeeded in getting the Baltic Germans to abandon their homes and homeland in haste. Due to the imposition of wartime rationing, Germans were banned from taking along any valuables, objects of historic value, fuels and even food. Massive sell-off of household items and small businesses followed. Larger properties, real estate and businesses were sold over a longer period of time by a special German commission to local governments. Some 13,700 Baltic Germans were resettled from Estonia by early 1940. Around 51,000 Baltic Germans were resettled from Latvia by early 1940. The Estonian and Latvian governments published books containing alphabetical lists of the names of resettled Baltic German adults together with their birthdate, birthplace and last address in the Baltics. Baltic Germans left by ships from the port cities of Estonia and Latvia to ports of Gotenhafen and Stettin and then were transported to Posen and Lodz in Reichsgau Wartheland (sometimes called Warthegau) and other Polish areas annexed by Nazi Germany. The "new" homes and farms they were given to live in had been owned and inhabited by Poles and Jews just a few months earlier who were executed or deported eastwards when Nazi Germany invaded Poland. The new arrivals fulfilled Nazi plans for ethnic Germanization of these lands. In early 1941, the Nazi German government arranged another resettlement for all those who had refused to leave in 1939 or 1940. The action was called the Nachumsiedlung. This time around no compensation was offered for any property or belongings left behind and this group of resettlers were treated with intense suspicion or considered traitors because they had refused Hitler's first call to leave the Baltics in 1939. Most of these arrivals were first settled in filtration camps. Unknown to the general public, the Nazi invasion of the Soviet Union was only 2 to 4 months away, and this was Hitler's last chance to transfer these people in peacetime conditions. By this time, the remaining Baltic Germans in Estonia and Latvia found themselves in a vastly different situation than in 1939. Their countries were now occupied by the Soviet Union, and intense pressure and intimidation had been put on anyone with a position of privilege or wealth before 1939. Mass arrests and some killings had taken place. Fearing a worsening of the situation, the vast majority of the remaining Baltic Germans decided to leave. About 7,000 resettled from Estonia by late March 1941, and approximately 10,500 resettled from Latvia by late March 1941. No books were published listing those who resettled in 1941; however, the present-day archives of Estonia and Latvia still have the lists of all those who left in this year. A very small minority of Baltic Germans refused again to be resettled and remained in the Baltics past March 1941. Some fell victim to the Soviet deportations to Siberian gulags beginning in early June 1941. The names and data of those deported from Estonia from 1941 to 1953 have been published in books. Details are kept at the Museum of Occupations in Estonia. After the Nazi attack on the Soviet Union and the conquering of Latvia and Estonia, a small number of Baltic Germans were allowed to return in order to serve as translators, but requests of many resettled Germans to be allowed to return to their homelands were denied by Himmler's SS. Many German Baltic men were mobilized in the occupied Warthegau and served in the German army. The resettled Germans fled west with the retreating German army in 1944. No precise numbers or lists are available for them. However, several thousand Baltic Germans remained in the Baltics after 1944, but they were subject to widespread discrimination (and possible deportation to Siberia until 1953) by the Soviet authorities ruling Estonia and Latvia. As a result of this, many hid or lied about their Baltic German origins. Most of those who stayed past 1944 were children of mixed ethnic marriages or themselves married to ethnic Estonians, Latvians or Russians and their descendants no longer consider themselves German. The Soviet Union's advance into Poland and Germany in late 1944 and early 1945 resulted in the Baltic Germans being evacuated by the German authorities (or simply fleeing) from their "new homes" to areas even further in the west to escape the advancing Red Army. Most of them settled in West Germany, some ended up in East Germany. In stark contrast to the resettlements in 1939–1941, this time around the evacuation in most of the areas was delayed until the last moment, when it was too late to conduct it in an orderly fashion, and practically all of them had to leave most of their belongings behind. Seeing as they had only been living in these "new" homes for only about five years, this was almost seen as a second forced resettlement for them, albeit under different circumstances. Many Baltic Germans were on board the KdF Ship Wilhelm Gustloff when it was sunk by a Soviet submarine on January 30, 1945. By one estimate, 9,400 people on board died, which would make it the largest loss of life in a single ship sinking in history. Additionally, many Baltic Germans died during the sinking of the SS General von Steuben on February 10, 1945. Two books listing the names and personal data of all Baltic Germans who died as a result of the resettlements and wartime conditions between 1939 and 1947 have been published by the Baltic German genealogical society: Deutsch-baltisches Gedenkbuch. Unsere Toten der Jahre 1939–1947 by Karin von Borbély, Darmstadt, 1991; and Nachtrag zum Deutsch-baltisches Gedenkbuch by Karin von Borbély, Darmstadt, 1995. Later, with Estonia and Latvia falling under Soviet rule after 1944, the Baltic Germans did not return to Soviet occupied Baltics again. Many thousands of Baltic Germans emigrated to Canada starting in 1948 with the support of Canadian Governor General The Earl Alexander of Tunis, who had known many Baltic Germans when he had commanded the Baltic German Landeswehr for a short time in 1919. Initially only 12 Germans were allowed to settle in 1948. Based on the good behavior of this group, many thousands of Baltic Germans were soon allowed to immigrate during the following years. A small group of Latvians and Baltic Germans emigrated to Newfoundland as part of then Premier Joseph Smallwood's New Industries Program. Several families in Corner Brook built, operated and worked in the cement and gypsum plants that provided essential material for the creation of Newfoundland's infrastructure after Confederation. Some better preserved tombstones in Riga's Great Cemetery. During the 50-year-long occupation of the Baltic states, Soviet occupation authorities governing the Estonian SSR and the Latvian SSR, politically empowered by their victory in World War II, were keen to erase any traces of ethnic German rule in past centuries. Numerous statues, monuments, structures or landmarks with German writing were destroyed, vandalized or left to ruin. The largest Baltic German cemeteries in Estonia, Kopli cemetery and Mõigu cemetery, both standing since 1774, were completely destroyed by the Soviet authorities. Great Cemetery of Riga, the largest burial ground of Baltic Germans in Latvia standing since 1773, also had the vast majority of its graves destroyed by the Soviets. The present-day governments of Estonia and Latvia, who regained their independence in 1991, generally take a positive, or sometimes neutral, view towards the contributions of the Baltic Germans in the development of their cities and countries throughout their history. An occasional exception to this comes with some criticism in relation to the major landowners, who controlled most of the rural areas of the Baltics, and the ethnic Estonians and Latvians, until 1918. After Estonia regained independence from the Soviet Union on August 20, 1991, the exiled association of the German Baltic nobility sent an official message to the president-to-be Lennart Meri that no member of the association would claim proprietary rights to their former Estonian lands. This, and the fact that the first German ambassadors to Estonia and Latvia were both Baltic Germans, helped to further reconcile the Baltic Germans with these two countries. Cooperation between Baltic German societies and the governments of Estonia and Latvia has made the restoration of many small Baltic German plaques and landmarks possible, such as monuments to those who fought in the 1918–1920 War of Independence. Since 1989, many elderly Baltic Germans, or their descendants, have taken holidays to Estonia and Latvia to look for traces of their own past, their ancestral homes, and their family histories. Most of the remaining manor houses have new owners, operate as hotels and are open to public. Baltic Germans played leading roles in the society of what are now Estonia and Latvia throughout most of the period from 13th to mid-20th century, with many of them becoming noted scientists or explorers. A number of Baltic Germans served as ranking generals in the Russian Imperial Army and Navy, including Michael Barclay de Tolly, Adam von Krusenstern, Fabian von Bellingshausen, Friedrich von Buxhoeveden, Paul von Rennenkampf, Ivan Ivanovich Michelson and Eduard Totleben. Many Baltic Germans (such as Baron Roman von Ungern-Sternberg, Baron Pyotr Nikolayevich Wrangel, Eugen Müller, and Anatol von Lieven) sided with the Whites and related anti-Bolshevik forces (like the Baltische Landeswehr and the Freikorps movement) during the Russian Civil War. ^ According to Gerhard Reichling, out of 250,000 Germans deported from the Baltic states in the Flight and expulsion of Germans 239,000 were Protestant and 8,000 were Catholic. ^ Miljan, Toivo (2004). Historical Dictionary of Estonia. Scarecrow Press. p. 121. ISBN 9780810865716. ^ Christiansen, Eric (1980). The Northern Crusades: The Baltic and the Catholic Frontier 1100–1525. Minneapolis: University of Minnesota Press. ISBN 9780816609949. OCLC 6092550. ^ "Baltic states - region, Europe". ^ a b c d e f g Rauch, Georg von (September 7, 1974). "Die Geschichte der baltischen Staaten". University of California Press – via Google Books. ^ "Latvia - Population". countrystudies.us. ^ a b Ķibilds, Mārtiņš (October 26, 2018). "After 700 years in Latvia, Baltic Germans vanished in a matter of weeks". Public Broadcasting of Latvia. Retrieved October 26, 2018. ^ "National History Museum of Latvia". ^ "Begegnung mit Wolhynien". www.myvolyn.de. ^ a b c Faure, Gunter; Mensing, Teresa (September 7, 2018). "The Estonians; The long road to independence". Lulu.com – via Google Books. Helmreich E.C. (1942) The return of the Baltic Germans. The American Political Science Review 36.4, 711–716. Hiden, John W. (1970). The Baltic Germans and German policy towards Latvia after 1918. The Historical Journal 13.2, 295–317.